This Chinese idiom is requested by Bananaz. Traditional Chinese: 老馬識途, Lǎomǎshìtú or 識途老馬 Shìtúlǎomǎ. Simplified Chinese: 老马识途, Lǎomǎshítú or 识途老马, Shítúlǎomǎ. Translation: An old horse knows the way. Today, a person who is very experienced at any given thing may be referred as "the old horse who knows the way". I've found some videos about the idiom story. I'm using this one from YouTube as it has Chinese subtitle and for practicing purpose. You may find the story is a bit different from what you may already knew. Both versions are used today. In the Spring and Autumn Period (770-476 BC), Duke Huan and the minister Guan Zhong of the state of Qi attacked the state of Shanrong. The king of Shanrong took his family and belongings to flee to the state of Guzhu. "Qí jūn yǐjīng zhuī guòlái le, nǐmen jiǎzhuāng tóuxiáng, ránhòu..."
"齐 军 已经 追 过来 了, 你们 假装 投降, 然后..."
"The Qi army has arrived, you pretend to surrender and then..."
"Jiǔyǎng Qí wáng dàmíng! Wǒ Huáng Huā yuàn wèi Qí wáng xiàoláo, wèi dàjūn dài lù." "久仰 齐王 大名! 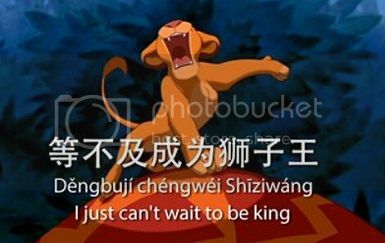 我 黄花 愿 为 齐王 效劳, 为 大军 带路。"
"I've been looking forward to meeting you, your majesty of Qi! I, Huang Hua, am willing to serve Your majesty of Qi and lead the way for the army." Marshal Huang Hua, go ahead and lead the way to the capital of the state of Guzhu." "Hǎo ba! Nà wǒmen jiù gǎnkuài shànglù ba!""好吧! 那 我们 就 赶快 上路 吧!" "All right! Let's hit the road!" It was a desert, deserted, windy and cold. The sky went dark, they lost their way. "Huáng Huā nǎlǐ qù le? ""黄花 哪里 去了?" "Bú zhīdào wa! ""不 知道 哇!" "Nà wǒmen shàngdàng le! Tā yīdìng shì jiānxì! ""那 我们 上当 了! 他 一定 是 奸细!" "Then we are fooled! He must be a spy!" "Dàjiā bié huāng! Bùfáng ràng jǐ pǐ lǎo mǎ shìzhe dàilù! ""大家 别 慌! 不妨 让 几 匹 老 马 试著 带路!" "Everyone do not panic! Might as well let some old horses to try to lead the way!" They led the Qi army out of the valley. Shì yònglái chēngzàn jīngyàn fēngfù, qíngkuàng shúxī, néng qǐ yǐndǎo zuòyòng de rén. Is used to praise a person who is very experienced and can play a guiding role. 1. Gather family or friends and play the roles. 2. Practice writing. CLICK HERE and hit the brushes next to each character to see the stroke orders. Grab a piece of paper and write them down. I hope you enjoy my first idiom post. Please comment => CLICK HERE. Hi Jeannie ~ Thank you have been practising the writing but the last stroke for 老 seems not 'smooth' thought it would be 'smoother' as second last, that's bananaz thinking haha. Trying to remember when the stroke should start from left to right or right to left. Great way to teach good morals together with the language. The video is really interesting too. Oh! I can't see the YouTube video because it's taking too long to load! But it's OK, managed to read what you written below the video. I still find it difficult to understand reading the hanyu pinyin because the sentence structure for English and Mandarin is different. Is it possible to translate all the Mandarin words into English words following the order of the Mandarin words although it makes no sense? Then after that, arrange the English words into a proper sentence so that we can make sense of it? When it takes time to load the video, I always let it load and then go do something else and come back later to watch. Pinyin is a tool to pronounce Chinese characters. I encourage you to focus on the characters instead of pinyin. After all, the characters is an important part of the Chinese culture. To understand each single Chinese character, copy and paste the characters or sentence on the MDBG dictionary in my side bar and hit Search. It should open a new window and show you the detail meanings. You can also click on the yellow speaker buttons to hear the pronunciation too. The meanings in the dictionary sometimes don't match the sentences. For example, Shānróng 山戎 and Gūzhú 孤竹 are the name of the states. The dictionary doesn't show those. I think I'll have to work on that. 1. Hit the "Stroke Order Animation & Dictionary" tab in the header. 2. Select "Simplified" or "Traditional" in the header as well. 3. Copy and paste Chinese characters or sentence into the search bar then hit the telescope button. 4. The characters you are searching will appear on the left. Click each to see the stroke order. After the stroke order is done, it'll pronounce it for you. I like the usage percent feature. It tells you how often the character is used. Not sure what you meant by "second last". to all of you whoever are interested in learning the stroke order as well. Sweetromance, thanks for your visiting and nice comment. Bananaz, sorry it took me a while to post. I think I may not be able to post every week. But I will still try. Big thanks to everyone for all your support! So we can request idioms tat we r not sure of? Bananaz, you are so sweet. Kelvin, yes, you can request idioms but I hope you don't mind to register as my free member. Just click the yellow button says "Register Here" in my side bar. Thanks a lot! I really like the cartoon. It is easy and fun to learn Mandarin using cartoons. Thanks for sharing this post. You are more than welcome and thanks for the comment. I'm glad you like it. There are more to come! OK, will try to learn the characters instead of the pinyin. LOL...Foongpc, I wish I could make 1 post every single day so I could reach my goal sooner! Don't worry...right now I could make 1-2 posts a week. And I plan to make a check list for you all so you can check which you've learned and which have not and come back to learn whenever you can. 对不起 , I had a bit of trouble with my last attempt at posting. I only started looking at these 成语 last week and then we started studying 成语 in class! So these are very useful for me . In all my trips around the world I have taken Chinese courses and I still feel I can't say a word in Chinese, is it that it's necessary to learn it in the country where it was born? @seanfs, you are welcome and I'm glad that they are useful for you. @Viagra Online, of course you can say words in Chinese. But learning Chinese in China or Taiwan is a boost to help you really see the beauty, the culture and hear how the people live and speak. Thanks. When I try to play the youtube video, it says it it private. Thanks for letting me know. Sorry that the video had become private. I have found another video and updated it but the last 2 lines has been cut. The video should be working now.